Customs Facilities Renovated at Cleveland Hopkins » OPShots.net - Cyberhub to Cleveland Aviation and the World! US Customs and Border Protection at Cleveland Hopkins International Airport. The Cleveland Plain Dealer – The international arrivals area including the U.S. Customs and Border Protection (CBP)’s Federal Inspection Service (FIS) facilities at Cleveland Hopkins International Airport have been renovated in anticipation of Icelandic flights doubling the number of international travelers passing through the airport. It’s good news for travelers who found the previous customs process time-consuming and cumbersome. Buses, which transported arriving passengers from the secure side of the airport to baggage claim, won’t be needed any more. 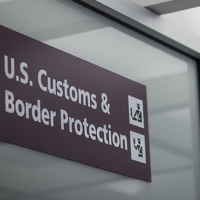 Instead, the airport plans to reinstall Transportation Security Administration (TSA) screening machines inside the customs area, allowing international passengers to pass through security before exiting through Concourse A. Last year, according to the airport, just over 48,000 passengers passed through customs at Hopkins. Most of that number is made up of passengers flying Frontier Airlines, Swift Air, United Airlines, and Xtra Airways from Mexico, the Dominican Republic, and Jamaica. Almost all international arrivals at CLE clear in this facility or just outside of it, including all general aviation/business jets, Middle Eastern Clinic Visitors (some dignitaries can request more private clearance), international charters, and some flights clearing to continue overflying the US rather than obtaining a permit. Passengers flying on Air Canada Express from Toronto-Pearson Airport in Canada pass through US CBP preclearance facilities prior to departing for CLE. The Customs facilities at CLE can hardly handle the number of passengers they experience now, but the new flights on Icelandair and WOW air will add 934 flights – and as many as 163,120 passengers – to the airport annually, according to airport spokeswoman Michele Dynia. This influx of international passengers necessitated the customs-area facelift, said Airport Director Robert Kennedy. Airport officials have been working with TSA for several months to eliminate the need for the shuttles. Although the plan has not been officially approved, Cleveland will likely get equipment from the Youngstown-Warren Regional Airport, which lost its commercial air service earlier this year, said TSA spokesman Mike England. TSA removed the screening equipment from Cleveland’s customs area in 2010, a year after Continental Airlines discontinued its trans-Atlantic flights between Cleveland and London. According to Kennedy, arriving international travelers (except those coming from Canada) must be screened before exiting into the secure area of the airport. Cleveland was able to get around this requirement by busing international passengers, after going through customs, to the unsecure side of the airport at baggage claim. But the process has been a pain for passengers, who often have to wait in long lines to board the bus. Kennedy said the new system would make connections easier, and might encourage Cleveland’s two new international airlines to link passengers to other destinations through CLE. Getting rid of the buses will help tremendously, said Coyle, who flew back to Cleveland from Punta Cana two weeks ago in a snow storm. He said the bus trip can add as much as an hour to the arrival process. Kennedy said the facelift may be a short-term fix, as airport officials consider longer term improvements to the space, which might include removing a wall and expanding the area on just the lower level. Best write-up I’ve seen of the changes. The PD’s description made little sense. The bus is less of a hassle than going through TSA again. There is no need to return to the sterile area as all of these customers are O and D.
Are they screening the checked bags before taking them to baggage claim too, LOL?